I don’t know if this term has ever been used before in comic books, but David F. Walker is leading the charge in “Social Comictary”. Walker and new artist Martin Morazzo are not afraid to push the issues of today as Nighthawk’s body count rises by 1 thug and 1 corrupt cop. The third as of the last two pages survives, barely. Sorry for the crypticness, but I’m trying to make this spoiler free as much as possible. Not for the squeamish, our protagonist in Nighthawk is not shy about impaling the bad guys and blowing stuff up. 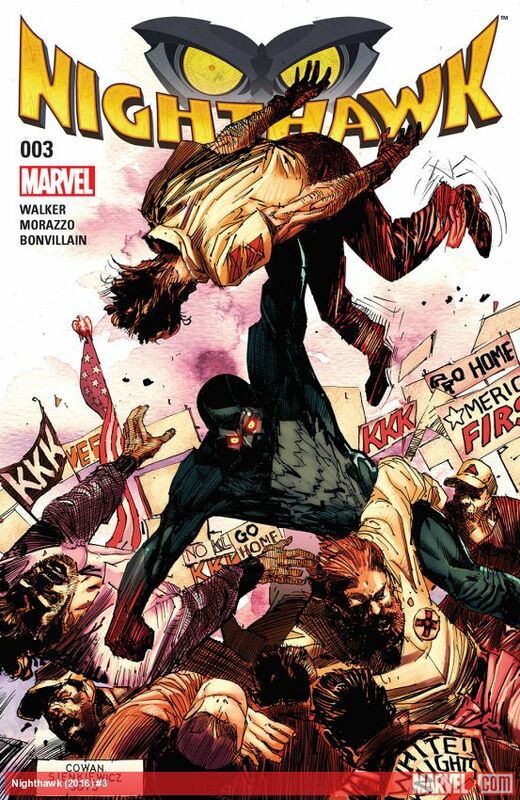 As the issue jumps around in time we see Nighthawk fight for his life as he stops another illegal gun shipment. On the other end, Detective Burrell starts to suspect a fellow cop of being the person that Nighthawk is looking for who covered up the destruction of the white supremacists warehouse in a previous issue. The focus of this issue’s Social Comictary continues exploring the issues of corrupt cops, illegal guns, and unscrupulous businessmen willing to flood the streets with firearms in order to drive out the families that live in the areas they want to develop. With the subject of guns, Nighthawk makes you wonder how all of these weapons can make it to the street and what will it take to stop this epidemic. Oh yeah, there’s also a serial killer on the loose, so if you’re a white offender, whose beaten the justice system, the Revelator is coming for you. This issues’ victim is a cop that walked free after killing an unarmed kid. New to the series artist Martin Morazzo continues to provide the graphic illustration of violence that populates the book from beginning to end. I’m not joking about two people getting impaled. What I didn’t mention in my last review was the cover artwork done by comic legends, Denys Cowan and Bill Sienkiewicz. Nighthawk is powerfully drawn fighting a mob of white supremacists, eyes blazing as he lifts one of the racists. It’s that power in his figure that draws the eye. George Carmona 3rd is an Artist / Designer, former Milestone Media Intern, former DC Comics paper pusher, book lover, lifelong comic geek and has been in 4 Star Trek novels. You can find his work at FistFullofArt.com or follow him on twitter at GCarmona3.